The shape of the castle is so iconic that Disney uses it in their logo. By today's standards, it seems a little small - and it is. 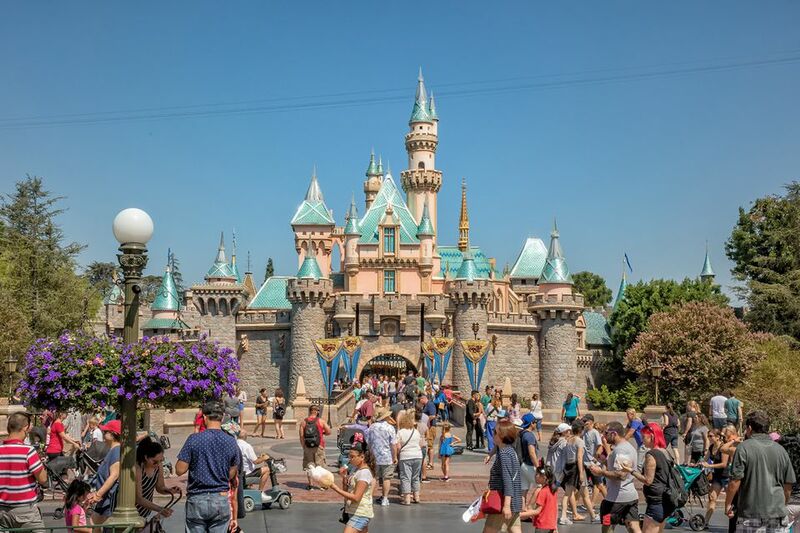 In fact, back in 1955, Walt Disney worried that a bigger castle would intimidate guests, so he built it small. The castle gets redecorated every few years. In 2005, it was decked in gold for the fiftieth anniversary and in 2015, it was all diamonds. The view above is the "winter" castle look. Walt Disney wouldn't allow a statue of himself in the park while he was alive, but now we can remember him and his little buddy Mickey. This statue in the middle of the "hub" may be the most-photographed spot in Disneyland. In California Adventure, you see a similar statue of a much younger Walt Disney with an earlier version of Mickey Mouse. Everything at Disneyland tells a story and that doesn't stop with the rides and shows. On Main Street USA, the names painted on the windows were not random selections. They're dedicated to friends and long-time Disney employees. This one is dedicated to Rolly Crump, a legendary Disney Imagineer who worked at Disneyland for more than 40 years. If you're a big fan of his work or just want to hear some great tales of Disneyland in the old days, you can order A Walk in the Park with Rolly Crump and let him take you on a guided audio tour of Disneyland’s most popular attractions. Some people find the Mad Tea Party - which most guests just call the teacups - a bit too intense, with all that whirling around. They're definitely iconic - and these little girls don't seem to mind the motion one bit. "I'm not lost, but my mom is," the security guard quipped. Lost children at Disneyland are quickly reunited with their parents by the capable staff. In fact, I have the utmost respect for Disneyland security and their ability to calm the most frantic of lost children in seconds. If you - or your child - gets lost, the place to go first is City Hall - or Chamber of Commerce in California Adventure. Even if you don't have children with you when you visit Disneyland, take a look at the kids who are meeting the characters. It may look like a person in a Mickey suit to an adult, but to the kids, it's clearly Mickey for real. I confess to loving a good character greeting, too. Especially on a less-busy day when they're ready to play and spend a little more time with each guest. Where else but Disneyland could someone go around wearing at Goofy hat all day and not feel out of place? Or a pair of mouse ears? Or a hat that looks like a fish? Adults are not allowed to wear costumes at Disneyland, so the grown-ups will have to limit themselves to headgear. 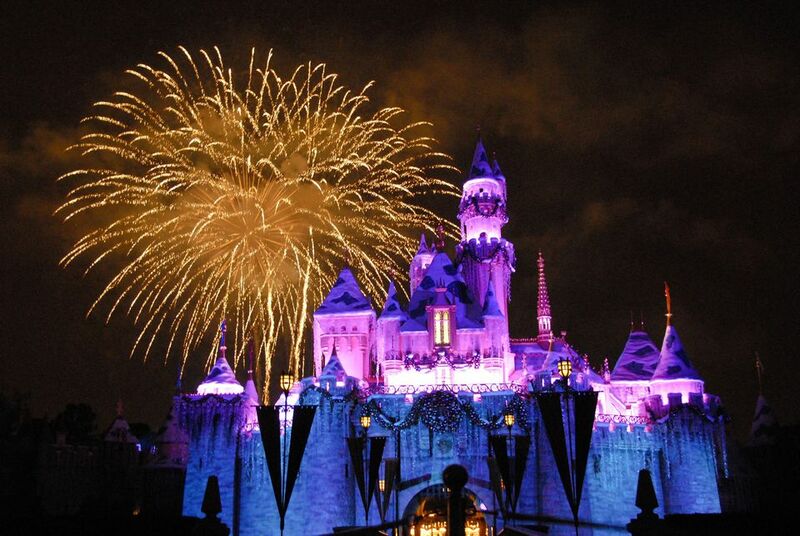 Disneyland can definitely wear you out, and a nap can help you keep going until the fireworks boom over the castle. Instead of taking your nap on an uncomfortable bench like this one, I'd suggest taking a couple of hours off at your hotel in the early afternoon. Then you can go back and have enough energy to stay and see the fireworks. Disneyland is by far the cleanest theme park I've ever visited. This cheerful bunch of street sweepers were walking along behind the parade, ready to sweep up anything the onlookers might have dropped. They wear out an astounding number of toy brooms every year, keeping the place looking clean. Disney employees say that anytime Walt Disney was in the park during his lifetime, the light in his private apartment above the fire station was on. After he died, the light stays on to signify that he's still present in spirit. The general public is not allowed into Walt's apartment, but you can see what it looked like inside when Disney still lived there by walking across to the Opera House, where some historic photos hang in the lobby. If you're a big fan of Walt Disney, you may want to visit the Walt Disney Family Museum, San Francisco.